Myriad Genetics will apply its BRACAnalysis CDx® test as a companion diagnostic for Clovis Oncology’s approved ovarian cancer treatment Rubraca (rucaparib), the companies said today. The value and other financial terms were not disclosed for the collaboration, which is intended to fulfill a post-approval regulatory commitment by Clovis to the FDA for Rubraca. Rubraca is a poly ADP-ribose polymerase (PARP) inhibitor indicated as monotherapy to treat patients with deleterious BRCA mutation (germline and/or somatic) associated advanced ovarian cancer, who have been treated with two or more chemotherapies, and selected for therapy based on an FDA-approved companion diagnostic for Rubraca. 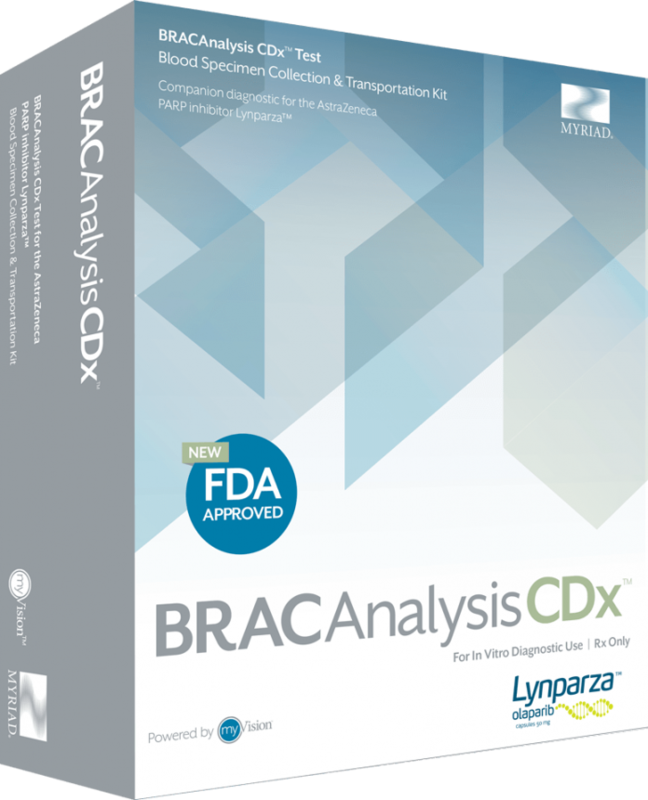 Since 2014, BRACAnalysis CDx has been an approved companion diagnostic for the first PARP inhibitor to win FDA approval, AstraZeneca’s Lynparza®(olaparib). And earlier this month, Myriad said BRACAnalysis CDx and its myChoice HRD test would be used by BeiGene to support development of BGB-290, its PARP inhibitor for ovarian cancer. In June 2016, Myriad said myChoice HRD successfully identified an increased number of patients with ovarian cancer who may benefit from treatment with Tesaro's PARP inhibitor Zejula (niraparib), which won FDA approval on March 27. Myriad has agreed to submit a supplementary premarket approval (sPMA) application under its existing PMA for BRACAnalysis CDx to include Rubraca. BRACAnalysis CDx is intended for the qualitative detection and classification of variants in the protein coding regions and intron/exon boundaries of the BRCA1 and BRCA2 genes using genomic DNA obtained from whole blood specimens collected in EDTA. Single nucleotide variants and small insertions and deletions (indels) are identified by polymerase chain reaction (PCR) and Sanger sequencing. Large deletions and duplications in BRCA1 and BRCA2 are detected using multiplex PCR. According to Myriad, results of the test are used in identifying ovarian cancer patients with deleterious or suspected deleterious germline BRCA variants, who are, or may become, eligible for treatment with Lynparza. “BRACAnalysis CDx is the only germline companion diagnostic test approved by the FDA to identify patients with BRCA1/2 mutations, and we are excited to support Clovis’ clinical development program and help identify patients who are most likely to benefit from rucaparib,” Myriad President and CEO Mark C. Capone said in a statement. On December 19, 2016, Rubraca became the second PARP inhibitor to win FDA approval. The agency approved Rubraca for women with advanced ovarian cancer who have been treated with two or more chemotherapies, and whose tumors have a deleterious BRCA mutation as identified by an FDA-approved companion diagnostic test. Also approved by the FDA that day was a companion diagnostic for Rubraca—Foundation Medicine’s FoundationFocus CDxBRCA test, the first next-generation-sequencing (NGS)-based companion diagnostic approved by the agency. The NGS test is designed to detect the presence of deleterious BRCA gene mutations in the tumor tissue of ovarian cancer patients. If one or more of the mutations are detected, the patient may be eligible for treatment with Rubraca. Myriad and Clovis noted in their statement that the FoundationFocus CDxBRCA does not discriminate between germline and somatic mutation. Foundation Medicine acknowledges that the tumor BRCA1 and BRCA2 mutations detectable through its tissue-based, genomic assay “may include both germline (inherited) and somatic (acquired)” mutations. Rubraca was approved under the FDA’s accelerated approval program based on objective response rate and duration of response, based on results from two multicenter, single-arm, open-label clinical trials involving 106 participants with BRCA-mutated advanced ovarian cancer who had been treated with two or more chemotherapy regimens. The trials measured the percentage of participants who experienced complete or partial shrinkage of their tumors (overall response rate). Fifty-four percent of the participants who received Rubraca in the trials experienced complete or partial shrinkage of their tumors lasting a median of 9.2 months. BRCA gene mutations were confirmed in 96% of tested trial participants with available tumor tissue using FoundationFocus CDxBRCA.